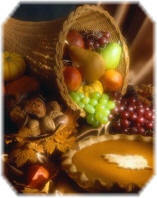 Thanksgiving Day is celebrated on the second Monday of October. It is a statutory holiday throughout all of Canada except the Atlantic provinces (New Brunswick, Newfoundland and Labrador, Nova Scotia, and Prince Edward Island). Before the first Europeans arrived in North America, the farmers in Europe would hold celebrations at harvest time. To give thanks for their good fortune and the abundance of food, the farm workers filled a curved goat's horn with fruit and grain. This symbol was called a cornucopia or "horn of plenty". When they came to Canada they brought this tradition with them. The first North American Thanksgiving was celebrated in 1578 when the English Navigator, Martin Frobisher, held a formal ceremony in what is now called Newfoundland, to give thanks for surviving his long sea journey. Other settlers arrived after him and continued these ceremonies. The first Thanksgiving Day in Canada after Confederation was observed on April 15, 1872, to celebrate the recovery of The Prince of Wales (later King Edward VII) from a serious illness. In 1879, Parliament declared November 6th a national holiday of Thanksgiving. Over the years many dates were used for Thanksgiving, the most popular was the 3rd Monday in October. After World War I, both Armistice Day and Thanksgiving were celebrated on the Monday of the week in which November 11th occurred. Ten years later, in 1931, the two days became separate holidays and Armistice Day was renamed Remembrance Day. Finally, on January 31st, 1957, Parliament declared the second Monday in October of each year to be "A Day of General Thanksgiving to Almighty God for the bountiful harvest with which Canada has been blessed". Most families in Canada celebrate Thanksgiving with a special dinner for family and friends. The dinner usually includes a roasted turkey and pumpkin pie. Thanksgiving provides an opportunity to look at pioneer life, and it is an ideal time to celebrate the importance of Canadian farmers for all Canadians.